Sustainable agriculture is an effective tool in ending poverty. In Kenya, although many communities have the fertile land required for sustainable farming and community enrichment, farmers cannot purchase critical tools to increase their efficiencies, improve crop yields or grow revenue. Over 90% of sub-Saharan Africa’s 48 million smallholder farmers lack access to formal credit. Without finance, the massive potential of the land remains untapped. FarmDrive uses data analytics to connect smallholder farmers with financial institutions and credit, enabling crops and farmers to flourish. And all through a mobile phone. There is a $450-billion financing gap for smallholder farmers. Although agriculture accounts for around 65% of employment and 32% of gross domestic product, less than 6% of commercial loan recipients are smallholder farmers. The situation is at an impasse. The farmers don’t have access to credit. They cannot purchase resources—vehicles, tools, higher quality inputs—to improve the sustainability or profitability of their operations. The financial institutions cannot provide loans without an accurate assessment of the farmers’ financial viability. – Cleophas Onyiego, young Kenyan farmer. FarmDrive uses data analytics and mobile technology to create financial profiles for farmers through a credit scoring model. When the financial institutions can view comprehensive profiles of a farmer’s economic performance, they are more likely to approve loans. Loans to purchase vital tools and assets. Insurance to bolster to protect against the natural seasonal vulnerabilities of farm work. Comprehensive financial profiles of their farming operations: a useful resource in scaling to service multiple partners or larger supply chains. Provide additional business opportunities for local communities. Create more food, health and education. In order to spark FarmDrive’s growth and ensure the ongoing sustainability of the venture, we secured seed funding in the founding-stage of the initiative. Early stage capital was bolstered through the presence of Long-Term Fellows. EWB fellows were embedded to offer knowledge and expertise throughout the crucial ‘middle support’ period – where ventures make the jump from local business initiatives to more scalable, vertically-integrated operations with large scale service partners. The key is addressing the lack of available financing, talent and strategic support for an enterprise too big for microfinance, and too small for commercial investment. Creating valuable credit profiles for smallholder farmers. The FarmDrive mobile platform aggregates and analyses information from traditional and alternative data points. The result is a comprehensive profile of a farm’s financial stability, drawn from satellite images, weather forecasts, produce buyers, agricultural dealers, and the farmers themselves. The platform tracks productivity, expenses and revenues. This information is logged within the platform and analysed to reveal performance patterns. Financial institutions can view the data and approve loans, all through a mobile phone. Working closely with a range of partners, FarmDrive has contributed loan portfolios of more than $25,000 to smallholder farming operations who had never received credit. Armed with this additional financial clout, farmers can purchase vital assets to markedly enhance the output of their operations. By securing credit to lease a tractor, a farmer can plough a crop in 30 minutes. This activity would take over 2 weeks manually. As an additional benefit, FarmDrive emphasizes the necessity of narrowing the gender gap. 60% of smallholder farmers are women; many of whom do not own the necessary assets to use as collateral in potential financing schemes. By creating loan products and risk assessment tools that do not rely on asset ownership, the platform simultaneously empowers a sector containing a significant proportion of women. Onboarding more than 1,500 smallholder farmers. Within the first quarter of 2016 alone, FarmDrive engaged over 1,500 farmers. Today, the platform is supporting thousands of farmers throughout Kenya. Partnering with the Technical Centre for Agricultural and Rural Co-operation (CTA-EU). The CTA-EU is a joint international institution of the African, Caribbean and Pacific Group of States and the European Union. It works with a wide network of public and private sector bodies, as well as international organisations around the world. 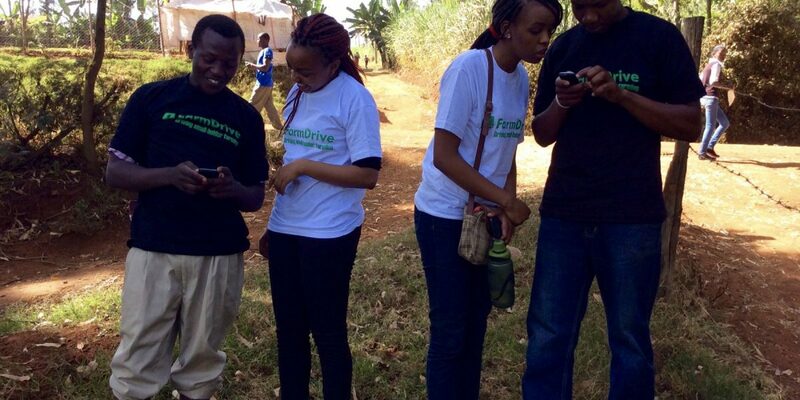 In partnership with CTA-EU, FarmDrive facilitates mobile training sessions dubbed “Apps4Ag Learning Opportunities”. These sessions equip young farmers to use FarmDrive to keep record of their farming activities, receive agronomic recommendations, and access loans and other digital financial services.